The Pilothouse is located on the Bridge level directly above Radio Central and the Chartroom. The central portion of the pilothouse is dominated by the base of the Mk-37 Gun Director which is located directly overhead. The whole base turned as well as the unit above, much like the base of the 5-inch guns located in the ammunition handling rooms. Main Sonar Control is located in the aft portion of the pilothouse. 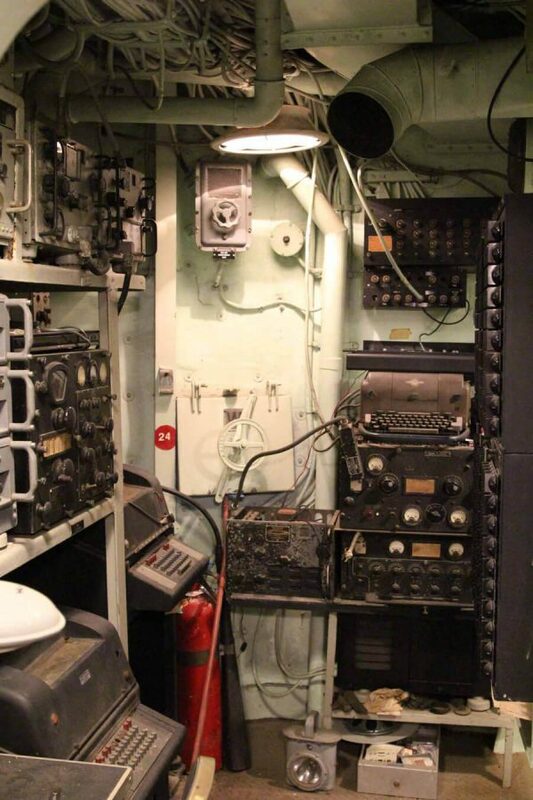 This is where the “ping jockeys”—as the sonarmen were nicknamed—would listen, searching for enemy submarines. Once located, they would guide the ship over the sound contact and depth charges would be dropped on the submarine’s estimated position. The term “sonar” comes from “Sound Navigation and Ranging.” Much like bats, dolphins, and whales, the KIDD’s sonar equipment emits a sound wave that is transmitted through the water. An object in the water will cause an echo to return. The time that the echo takes to return gives the object’s distance away from the ship. 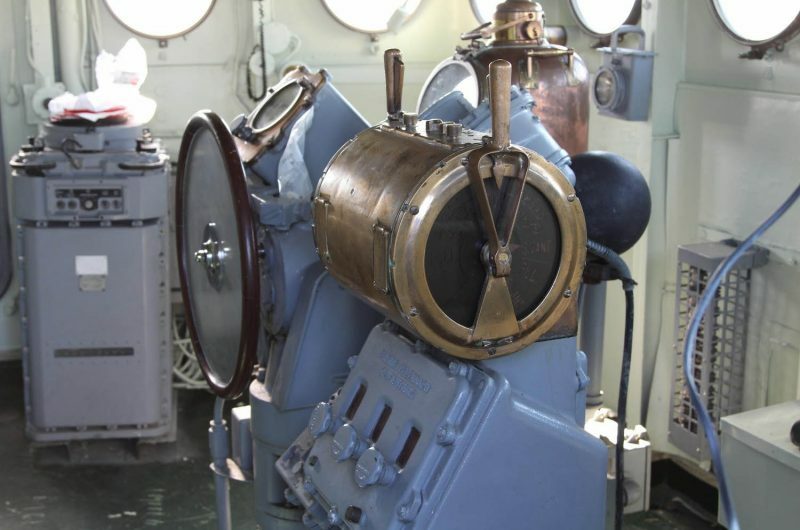 World War II sonar gear—designated QGB—was similar to a searchlight beam in that it only scanned a small area at one time, constantly shifting in a circle as it scanned. It was for this reason that multiple destroyers would often accompany the larger battleships and aircraft carriers, surrounding them in a circle with each destroyer tasked with sonar scanning outward in a certain degree arc. The time taken to complete a scan was greatly shortened this way. Postwar sonar sets are omni-directional with the sound going out in all directions at once. The equipment shown here is designated SQS-4 sonar and represents U.S. Navy sonar development for the 1950s. The large box with the black dials is the computer for solving underwater fire control problems. The device located near the door is the TRR (Tactical Range Recorder), used to keep track of a submarine once contact has been made. Located Immediately aft of the pilothouse is also the Captain’s Sea Cabin where the C.O. (Commanding Officer) would live when the ship was underway. Here, he was close at hand should an emergency arise. 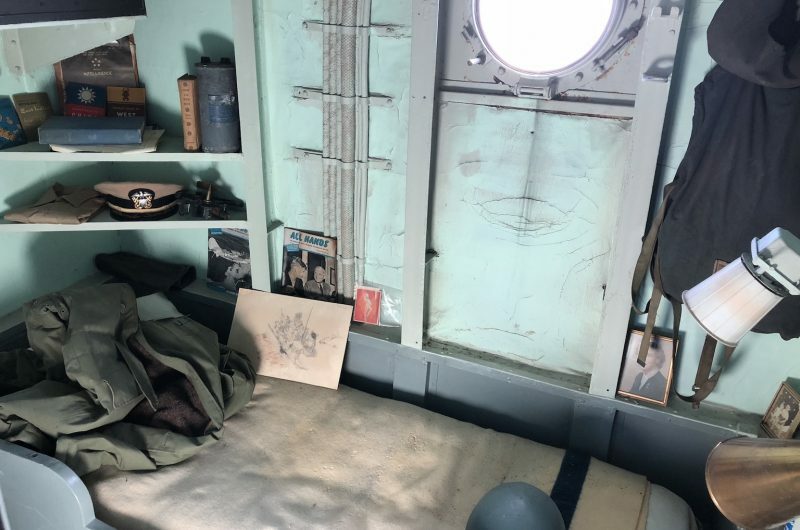 A very small and cramped space in comparison to the In-Port Cabin located two levels below on the Main Deck, the Sea Cabin was just barely wider than the bunk it contained. A small head (bathroom) was also located here. 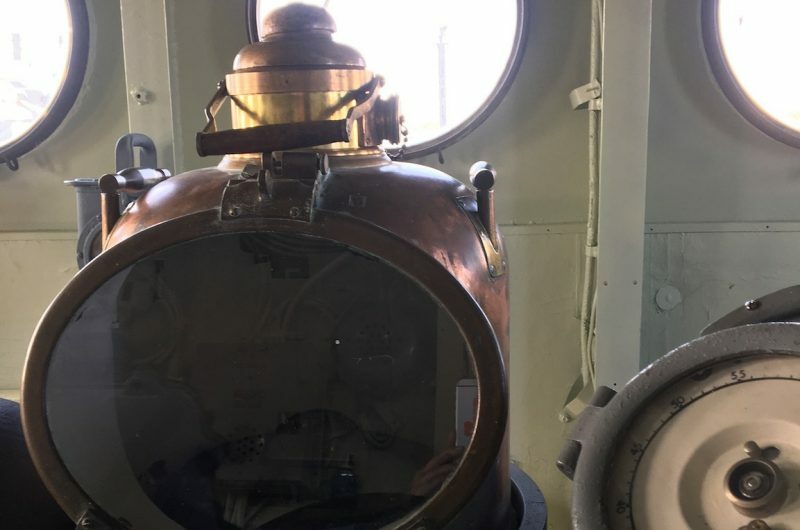 In the forward portion of the pilothouse, the ship was steered by the helmsman who kept the ship on course by watching the gyro compass repeater. A magnetic compass was located in the binnacle for use in emergencies. 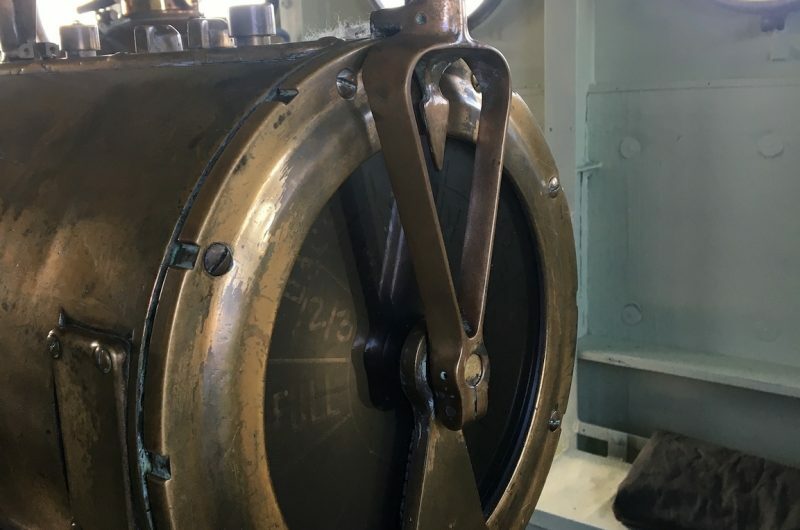 The lee helmsman sent orders to the enginerooms by means of the mechanical Engine Order Telegraph, a brass column with handles on each side located to one side of the helm (ship’s wheel). 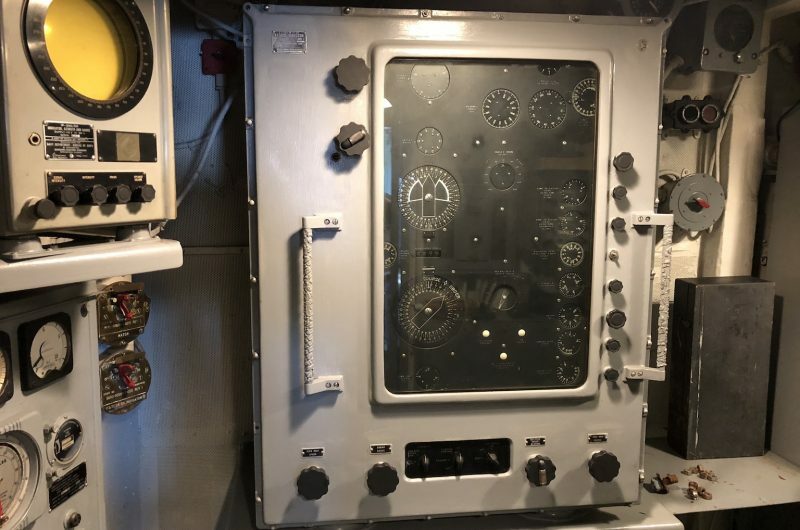 Other equipment located in the pilothouse includes the chart tables, control panels for the ship’s navigational lights, alarms, radar repeaters, and communications equipment. The open area outside of the pilothouse is known as the Captain’s Bridge. 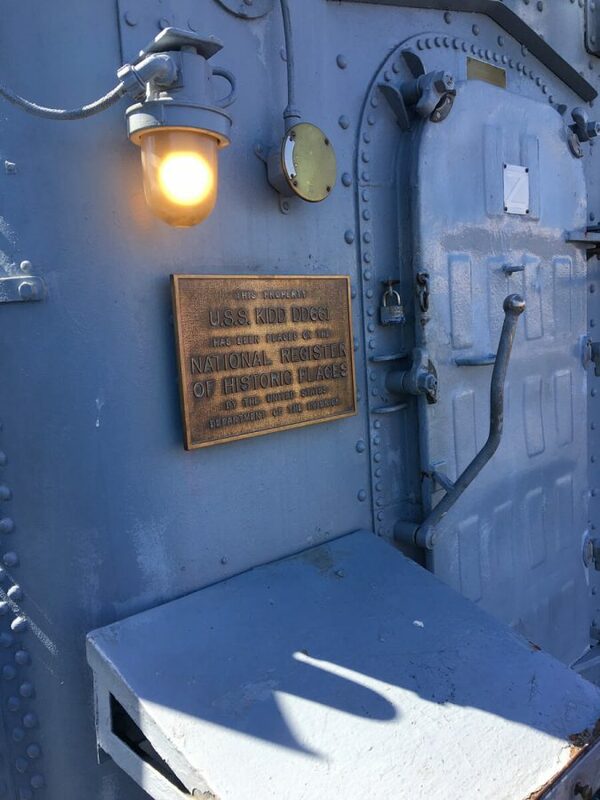 On the bridge, the Officer of the Deck (OOD) controlled the ship by issuing orders to the men in the pilothouse, enginerooms, and the gun control stations. 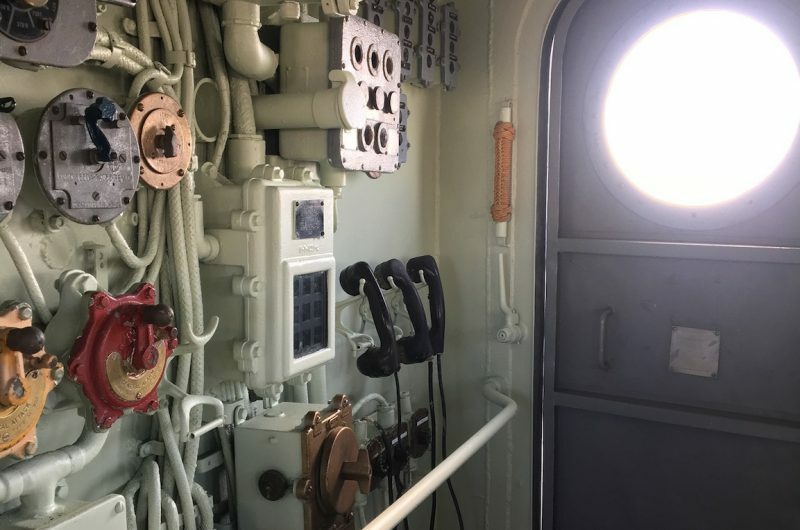 Communications was accomplished by enlisted men with sound-powered telephones, the 1-MC intercom unit, voice tubes, or by yelling through the portholes into the pilothouse. The captain’s chair was located on the port side bridge wing. During emergencies or battle stations, the captain could take direct control of the ship. The bridge has no roof so as to give a clear view of the sky during air attacks. It was an uncomfortable place to work during foul weather. Just as the 5-inch guns could be operated remotely by the Mk-37 gun director located above the bridge, most other weapons systems aboard ship could be operated remotely. 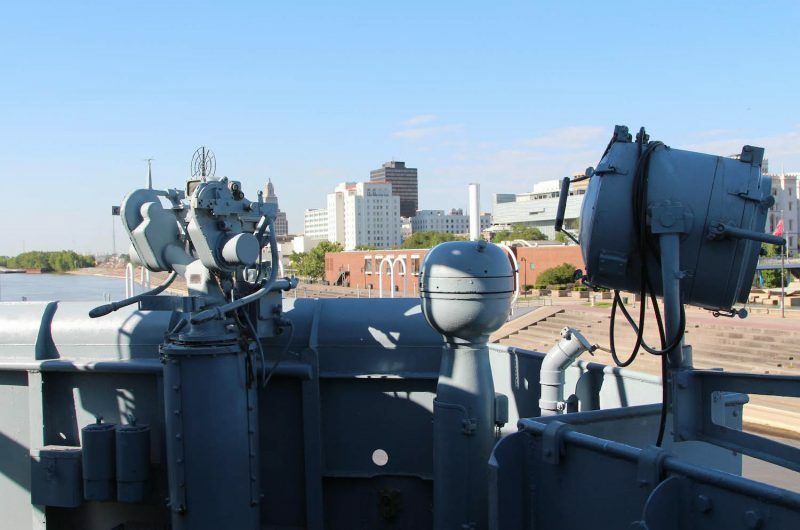 Two Mk-51 remote gun directors for the forward twin 40mm gun mounts are located on the forward corners of the bridge. On the aft corners of this level are two Mk-27 torpedo directors. On the aft port side bulkhead of the pilothouse, push-button controls are mounted for remotely firing the six K-gun depth charge projectors. Located immediately beside the K-gun firing controls, two long levers can be used to drop depth charges from the fantail tracks using a hydraulic system. 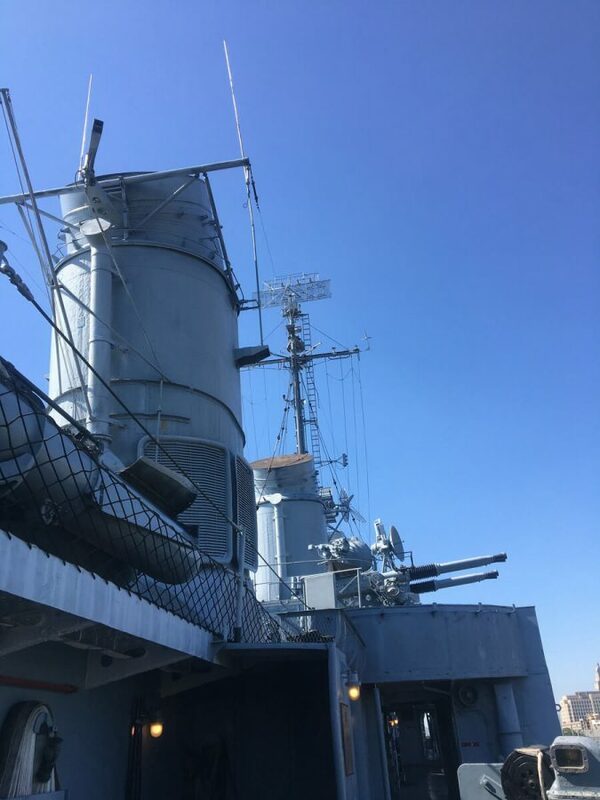 Only the 20mm anti-aircraft guns, the quad 40mm gun mounts, and the twin 40mm gun mount located atop the aft deckhouse could not be remotely controlled from the bridge, taking their cues instead via communications. Nine men manned the bridge and pilothouse during normal Condition II wartime cruising. Condition I was known as “general quarters,” with all weapons manned. Condition II was wartime cruising with some weapons manned and Condition III was peacetime cruising with no weapons manned. At the rear of the bridge is the Signal Bridge. This was the center for visual signals to other ships steaming in company with the KIDD. Signals originated by the Captain or the Officer of the Deck and were relayed by signalmen to other ships using one of three means of communication: semaphore, signals flags, or 12-inch signal lamps. Lookouts constantly checked for other ships that might be signaling the KIDD. Semaphore is a mode of communication involving a signalman standing on a high, easily visible platform while holding two flags and extending his arms to different positions that represent letters of the alphabet. This was the most rapid way of communication, well-suited to plain language, but usable only in daylight. Another system of communication was the use of signal flags hoisted to the yardarms (the horizontal beams on the ship’s mast) via the ship’s halyards (pulley lines). 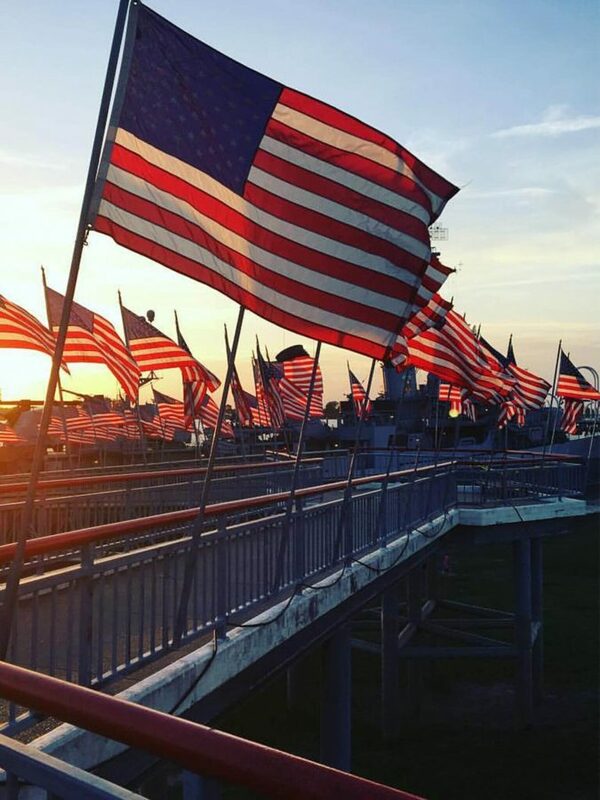 Each flag or pennant represented a letter, number, or tactical term. Flags and pennants were given single, double, and triple letter meanings. Signal code books were used to encipher messages. Naval ships have special codes that are kept secret. The international code of signals is known to all nations and used when communicating with merchant vessels. The signal flags were hung inside the flagbags, thecanvas-covered boxes located at the rear of the bridge on both port and starboard sides. When making up a message, signalmen would rapidly clip the flags to the halyards and then “two block the hoist” (i.e. raise it to the top). Other ships would hoist an answering pennant to show that the signal was received and understood. 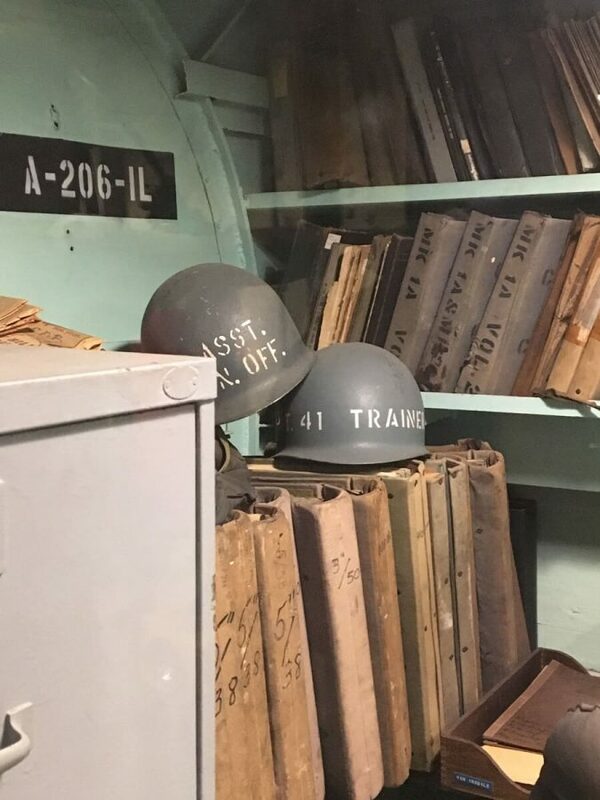 The final communications system used by the signalmen was effective both day and night: the 12-inch signal lamps. Messages could be sent via these lamps by flashing Morse Code. Four of these lamps are located on the bridge level.